Next door to our house is an empty lot, and it looks like it was always just an empty lot perched on the edge of the neighboring field, since the beginning of time. It was a surprise to find out from a local old-timer that there was once a large home there that had burned to the ground. Sure enough, this time every year, you see the evidence that someone once lovingly planted spring bulbs around their home. The crocuses and daffodils return annually as a reminder that someone lived and planted there a long time ago. As I like to say, spring lays secrets bare. cleaning, other than maybe a quick window washing. where maintaining the chaos and wiping down a dirty corner when I can, and not one minute before, is the order of the day. It reminds me of something I read about how we need to see our homes as a tool for living, and sometimes tools get well used. It was very encouraging be reminded that I'm not decorating a museum, but sharpening my tool. A tool that somehow functions as a central place to meet our needs, but should not become the need. I want to think like that all the time, about all kinds of things. Have you read Saloma's new memoir yet? 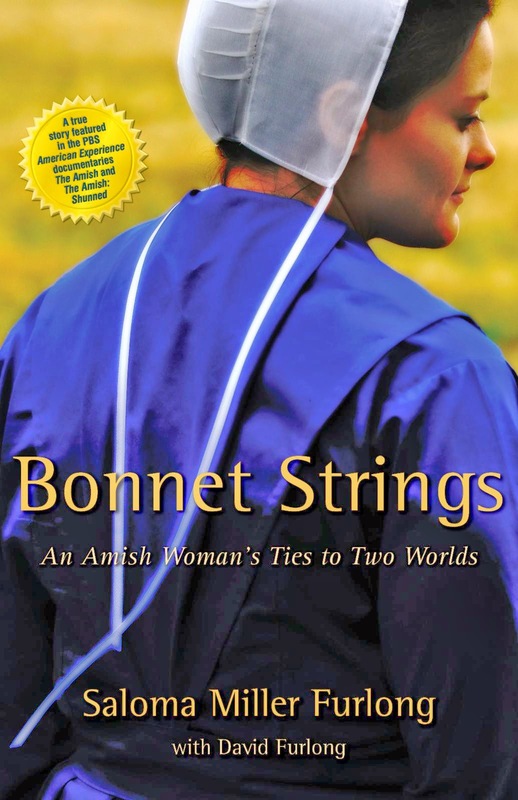 Bonnet Strings: An Amish Woman's Ties to Two Worlds is the sequel to her first book, Why I Left the Amish. It follows her to Vermont, where she starts a new life after leaving her Amish community, and then her ensuing struggle when she returns to Ohio to try again. Even though I know Saloma's story well, and how her life turned out, it was still a suspenseful story for me. It wasn't always easy to read about the agonizing decisions she faced at such a young age, and with such limited experience. When she makes her final decision after an epic struggle, you can be rest assured that it was not a decision that was made lightly. Anyway, here is your chance to win a signed copy of Bonnet Strings. Simply leave a comment here for one entry. I will contact the winner in one week. If you don't have a blog, make sure there is a way I can reach you if you are the winner. Share on Pinterest or Facebook for one additional entry, and don't forget to tell me that you shared. It's too early to be thinking about rhubarb, but I saw some tiny red stalks peeking through the ground in our garden. It reminded me to use up what we had left in our freezer. 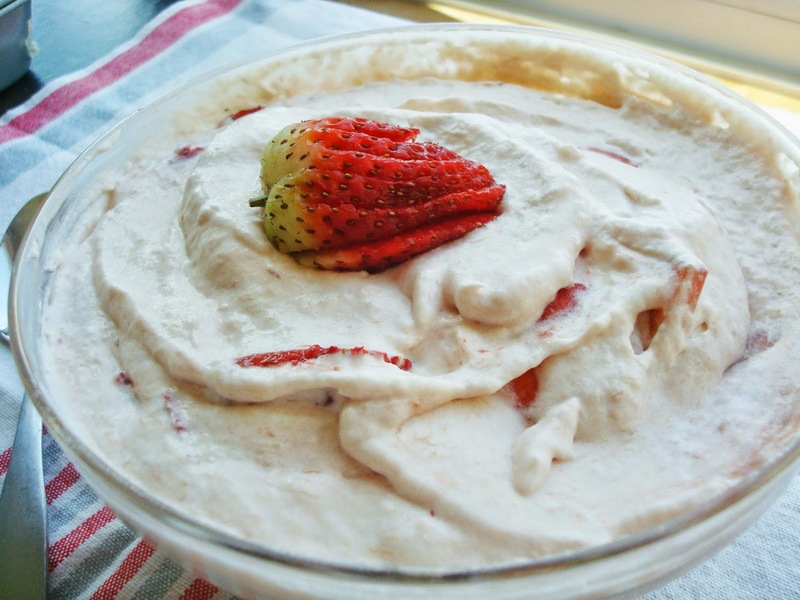 I always wanted to make a fool, which is a British dessert of blended fruit puree and whipped cream. It was completely coincidental that I made it on April's Fool day. I made it with the last of our rhubarb and a few sliced strawberries. It was delicious! You can follow the link to the recipe. Your rhubarb recipe looks delicious! We can't grow it very well here, but my husband still tries since he loves it so. I saw Saloma on a PBS program about the Amish and would love to read her book. I hope you get a chance to read my book. Thanks for commenting. Becka, you won. Please contact me at themennobrarian at gmail with your info so I can send it out. I have her first book but not the second one. Thanks for a chance to win! How wonderful to hear from you again. Yes, I heard Saloma's interview on NHPR not long ago. Very interesting life story. Spring has come finally to our little farm on the hill. We are collecting sap and making some maple syrup. We are doing a little bit this year, just for us to use. It's so wonderful to hear the tap, tap of the drips into the buckets. Rhubarb is still 3 feet under snow, but the snow is melting and mud season is going to be viscious. When my girls were little we rarely did spring cleaning, Who wants to clean when the weather is so lovely. Mrs. Doug, your description of the sound of the sap dripping into the buckets sure does take me back to the farm where I grew up. Enjoy the fruits of your labor... there is nothing like the light and sweet taste of the first syrup of the season. Spring cleaning... uhh. I cannot even think about that right now. Oh this book sounds lovely! I hope you get a chance to read the book. I love the name of your blog! I love what you said about spring cleaning and how your house is a tool to meet your family's needs....very encouraging! I have read Saloma's blog a while back....her story is amazing! Randi, so glad you like reading my blog and thank you for your compliment about my story. My guess is you have one to tell, also. I love Saloma and her books! I've known her story a long time but love her style of writing and went cover to cover in two sittings (only because I had to work in the morning) when her new book first came out! I had the privilege of meeting her and her husband a couple of years ago. I love flowers - a lilac bush that appears to be "random" is also a sign of a life lived long ago. I can't find ANY of my spring flowers, yet - I'm hoping I'm just a few days too early and will look again :-( and again if I have to! Peggy, I know you met Saloma before you met me, but that is all I know for sure. That is such a good observation about the lilac bushes, too. Once in a while I see a random daffodil coming up on the empty lot, too. I have followed Saloma, Monica and Mary Ann's blogs for a long time and would be delighted to win a copy of Saloma's book. I love hearing from you. Please share your comment. I'm Monica, and I am always baking something scrumptious. I invite you to eavesdrop in my kitchen as I share the humor and joy of life on our tiny farmette. The Mister and I live out our faith in the Mennonite church, and strive to live simply. Thank you for reading!